The Asante people (also known as Ashanti) live in the forested area of central Ghana, Africa. Their carvers are famous for a female doll figure known as Akuaba which features an enlarged circular head and stylized elongated body. When blessed by the native priest, the figure is thought to act as a fertility charm (helping women conceive). To obtain its powers, an Asante woman would carry it around and treat it like a real child. The adult figures of this Holy Family are approximately 8 inches tall. In African society fertility is extremely important. “Both men’s and women’s significance in life is judged by the number of children they bring into the world. To have no children is regarded as a great human tragedy. Boys tend to be more strongly desired since they can help with the physical labor. At the same time having girls is not considered a bad thing. Girls will ensure that the family legacy is passed on through more children. The Asante (Ashanti) believe that the children gain their “ntoro” (spirit) from their father and clan membership from their mothers’ blood, “mogya”. In turn, a female Childs’ entire life was a preparation for motherhood. 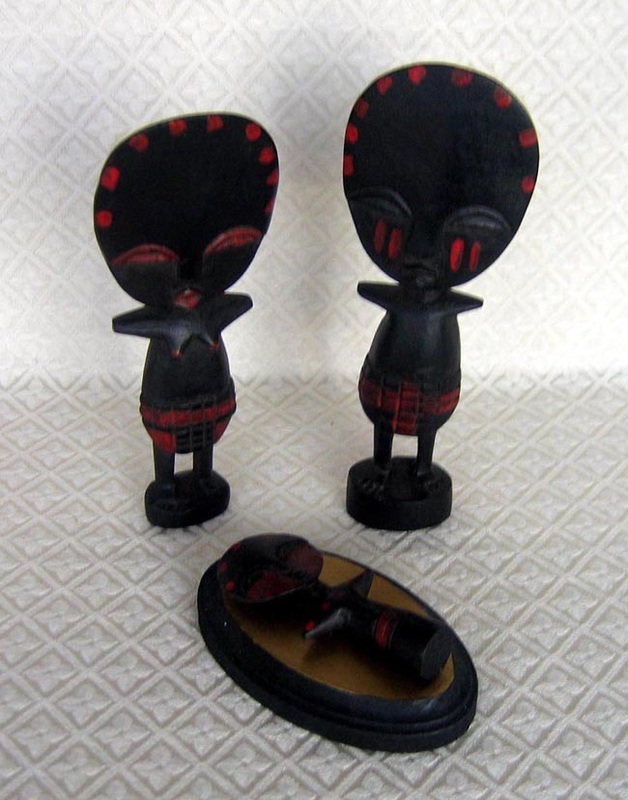 Even now, the “Akua’ba” (fertility doll) of the Akan (ancestors of the Asante) and Asante are used by young women hoping for a child. Legend has it that a woman, who has worn one of these dolls, will give birth to a beautiful child. Bodily aesthetic beauty to the Asante is a long neck, a high forehead and a small mouth. Traditionally, the user of the Asante doll would have it prayed over, strap it to her back, carry it the way she would a real child and generally tend to the doll as if it had life. Scarifications will vary slightly from doll to doll. Today, these dolls are placed in the main area of intimacy.